When James returned to Palestine in 44, was tortured and beheaded by Herod Agrippa, and was buried banned; his disciples secretly at night carried his body to the sea. They took the body of the Apostle to the Roman port of Iria Flavia, the capital of the Roman Galicia. That territory was then ruled by Queen Lupa or Wolf, the cruel, despotic painting because I put all sorts of obstacles to the disciples when they asked him a place to give decent burial to the Apostle. They say that, given a couple of bulls that the disciples had to tame before pulling the hearse. When I saw this prodigy, Wolf Queen gave her consent to give land to the holy body in the woods Liberum Donum, where they erected an altar on the marble tomb. It was eight centuries, a hermit named Pelagius saw a big flash of that forest and went to inform the bishop of Iria Flavia, Theodomir, leaving his bishop glory of discovery. Based on this event to place stellae Campus, or Field of the Star, from which derive the current name Compostela would be called. 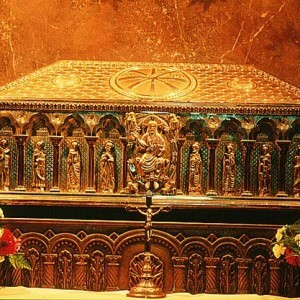 Here, his remains were buried in a tomb, where they would rest then also those of his two disciples. Theodomir, who after taking his weed discovered the remains of the apostle identified by the inscription on the tombstone. 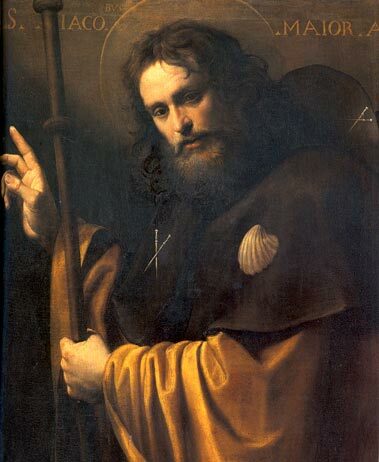 He informed King Alfonso II of discovery, rushed to the scene and proclaimed the Apostle James the patron of the kingdom, building a shrine there which later would become the Cathedral. The fabulous discovery spread from mouth to mouth until the court where Alfonso II “the Chaste”, ordered the building at the same location of a church, with the passing of the centuries, would be a symbol of all Christendom. The growth of Santiago de Compostela was such that the old bishopric of Iria Flavia was transferred to this emerging area. Little is known of these early years although Compostelana History provides details of the life of the successor of Bishop linked to changes of the early church Theodomir. Several archaeological remains confirm the existence of a fort on the site where it appeared the grave of James. This castro, based in the hub of a road network, where the necropolis belong appeared apostolic tomb and it population is documented from pre-Roman times to the Middle Ages. However, in the s. IX, when the discovery of the body of the Apostle, the settlement was abandoned. The bishop of Iria Theodomir and Asturian King Alfonso II give the place a legal structure and develop a constructive activity that will be the locus Sancti Jacobi. This building, about three acres, physically and spiritually isolated from the outside world by a close defensive. Episcopal and monastic complex: Inside two sets of buildings are distinguished. The first would include the church of Santiago probably one nave, attached to burial edículo acting as a single apse and altar of James. In its surroundings there was a cemetery in use until the s. XI. We imagine this church as a work of crude masonry at the mention of it is made in the act of consecration of the basilica later Alfonso III, the former describes as Mourning petra et operate parvo. North of this building and near it a baptistery dedicated to Saint John the Baptist stood. In the southwestern part of the locus a residence for the bishops of the iriense headquarters, from the discovery of the mausoleum, moved to Compostela is constructed. The heads of apostolic worship were Antealtares monks. The monastic complex is rising up to practically bordering Santiago church and separated, perhaps, by a fence. By its position on the churches of Santiago and San Juan, the monastery was called Antealtares. This set consisted of a church dedicated to the Saviour, possibly, with three altars dedicated to the Saviour, St. Peter and St. John Evangelist and a monastic offices. When the remains of sepulchral edículo rediscovered in 1879, hidden from the s. XVI, a chamber consisting of two compartments communicated between them was found. The limited data that can be drawn from this -cimientos structure of a mausoleum with Roman Romana blocks or tradition led to different hypotheses about its original appearance. The newer studies edículo primitive architecture as a modest, single camera in height, with an altar over the tomb of the apostle and eastbound access. You may vaulted interior was decorated with marble, facilitating the assimilation of the mausoleum with place names and Arce Marmarica Marmarica Ark with those mentioned in the ancient texts where lay the body of Santiago. Currently arrive at the cathedral thousands of pilgrims from all over Europe, mainly in the Holy Year.